This dialogue from the Irish playwright’s spare, modernist work epitomizes Dan Ramirez’s oeuvre. More importantly, the play’s exploration of the cycle of death, redemption and re-birth can be seen as a metaphor for this significant artist’s return to his hometown after a ten year absence, and his accompanying artistic rejuvenation. 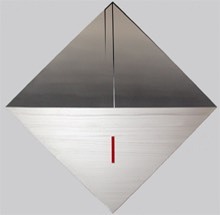 Indeed Beckett’s own descriptions of his play, “a matter of fundamental sounds…striving all the time to avoid definition,’ uncannily suggest Ramirez’s minimalist, music-inspired compositions of the 70’s and 80’s, as well as the resurrection of their signature vocabulary in his current paintings. Though familiar, his formal elements—monolithic, shimmering vertical bands, evanescent gradations of tone, razor-thin tapering bars—resist easy categorization. They neither reveal absolute truths, nor deconstruct systems of logic. Instead, they are always intuitive and emotional expressions of the artist’s deepest personal responses to his life. However, it is Ramirez’s unspoken, albeit unlikely, kinship with another modern master of stillness and shifting perceptions, the painter and sculptor Alberto Giacometti , that allows insight into his veiled language. For both artists, sight is paramount and always suspect. The elusiveness of an edge between a shape and its surrounding space reveals the fiction behind complete comprehension of our environment, and our relationship to it. The internal conflicts that arise from the resulting reverberations make palpable the renewal of Ramirez’s distinctive voice.